Surveillance video obtained by NBC Connecticut shows the moment of impact Saturday morning when a Coach USA bus packed with more than 40 Princeton University students crashed into a business on West Haven’s Campbell Avenue. 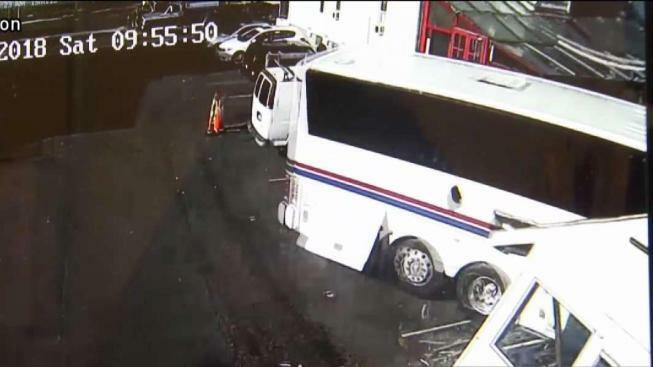 Surveillance video obtained by NBC Connecticut shows the moment of impact Saturday morning when a Coach USA bus packed with more than 40 Princeton University students crashed into a business on Campbell Avenue in West Haven. Four students and the bus driver were taken to Yale-New Haven Hospital, but police said nobody was seriously hurt when the bus exited I-95 northbound, came down a steep ramp and slammed into the Anderson Glass Company building. The students were traveling to the Yale Bowl for the Princeton-Yale football game. According to public records from the Federal Motor Carrier Safety Administration, the bus had a satisfactory safety rating as of late July. As seen from DroneRanger’s exclusive images above the scene, the accident leveled part of the shop. The debris clean-up continued Monday afternoon after the business reopened. The glass company’s president John Anderson called the bus driver "a hero," knowing the damage and injuries could have been worse. "From what I understand, he was telling all the students 'I don’t have any brakes, get ready,' and he drove his bus into the softest target here, which was the garage and fortunately nobody was in that," Anderson said. West Haven Police told NBC Connecticut they suspect brake failure for two reasons: statements from the Princeton students on board and the lack of skid marks at the scene, leading investigators to believe the brakes were never applied. On the highway, signs warn about the steep ramp and say "No Trucks." NBC Connecticut reached out to the state Department of Transportation to ask if that “No Trucks” sign applied to large buses, but a spokesperson said he had to wait until after the holiday to provide a response. "There have been a few accidents here before, nothing to this scope though," Anderson said. According to the Connecticut Transportation Safety Research Center at UConn, since 2015 there have been 30 crashes by NB Exit 43 and Campbell Ave. None resulted in any deaths or serious injuries. This past July a speeding car being operated in a reckless manner took a similar path of the bus crash, Behavior Analyst Marisa E. Auguste, MS, told NBC Connecticut by email. "We can fix the building," Andersons said. "Just happy everyone is safe." A representative from the bus company had no comment for NBC Connecticut on Monday other than they are cooperating with the police investigation.